Tracker's PDF-XChange Pro 2012 ($74) bundles a number of PDF-XChange apps that together attempt to create a suite comparable to the $449 Adobe Acrobat X Pro, just for much less money. According to Tracker, PDF-XChange Pro is a favorite download for corporations--and based on price alone, what CFO wouldn't be happy? But is PDF-XChange Pro 2012 a good deal for the little guy, too? PDF-XChange Pro 2012 gives you complete control over PDF file creation, whether you initiate the process individually from a Windows application or in a batch from Microsoft Office. The package is confusing when you first install it, mainly because no single PDF-XChange Pro 2012 program exists. Rather, this offering is a collection of individually available PDF-XChange programs. When you open any Windows-based application and choose to print, PDF-XChange Printer 2012 will be one of your print options. Once you've created your PDF, it will open in PDF-XChange Viewer 4 Pro, a full featured PDF viewer and editor. Unlike the free version of PDF-XChange Viewer, this version allows you full control over modifying PDFs, including the ability to extract content, renumber pages, resize your document, and more. 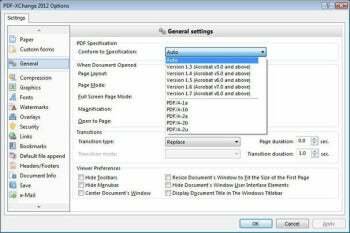 Stand-alone, PDF-XChange Viewer 4 Pro costs about $38. PDF-XChange Pro 2012 also includes PDF-XChange Tools 4 (which costs $45 stand-alone and comes with PDF-XChange Viewer 4 Pro). This part of the bundle allows you to use wizards to create PDFs from images, text, or scans; add or modify bookmarks; change page sizes, crop, and rotate pages; extract, split, or merge pages; convert PDF files to text; add overlays; optimize your files; add hyperlinks; and email or upload the files. The advantages to buying PDF-XChange Pro 2012 are more readily apparent if you use Microsoft Office. PDF-XChange Pro 2012 includes a Microsoft Office add-on and a batch converter that works with Office 2003 and later. These items allow you to individually convert or batch-convert Microsoft Office features such as Web forms and table of contents clickable links into interactive PDFs. The trial of PDF-XChange Pro 2012 imposes no time or feature limitations. However, any new PDFs you create will contain what Tracker calls a "demo watermark"--an obtrusive stamp that links to the company's website for you to buy the software--so you should be sure to try out the software in plenty of time to buy the full version (or redo your project in another program) before your final report is due. Once you've purchased PDF-XChange Pro 2012, you'll need to uninstall the trial, reinstall the package with the license key, and then remake your PDFs without the demo watermark. Note, too, that both PDF-XChange Viewer 4 Pro and PDF-XChange Tools 4 are due for an upgrade to version 5 later this year. According to Tracker, if you own a license to PDF-XChange Pro 2012, you'll be able to upgrade the programs within the bundle as they're released. If you don't want to spend $74 on PDF-XChange Pro 2012, be aware that you can find most of the features it offers over and above the $45 PDF-XChange Tools 4 elsewhere for free. For example, Blueberry's PDF Form Filler will add clickable URL links to an existing PDF, DoPDF can convert files from most Windows applications via the printer list, OpenOffice has interactive-form creation and "convert to PDF" functions built in, and the free version of PDF-XChange Viewer is excellent. But if you don't want the hassle of multiple programs, or if your employer expects you to use Microsoft Office, PDF-XChange Pro 2012 is a great alternative to Adobe Acrobat X Pro. In the PDF-XChange Pro 2012 bundle, you get a complete PDF reader, writer, and editor.